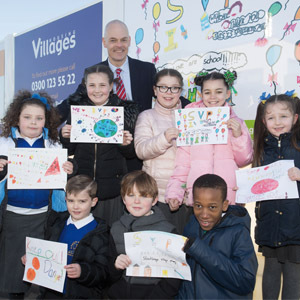 School children from across Stockbridge Village gathered at The Withens housing development to unveil designs that they have produced for hoardings at the site. Villages Housing Association, a member of the ForViva Group, is investing £12.4 million in The Withens extra care facility, which is being built on land next to the older people’s apartments at Roughsedge House. The scheme will include 90 new properties, including 64 extra care homes and 26 bungalows for affordable rent, and will be the first new affordable homes built in Stockbridge Village for a decade. Children from Stockbridge Village Primary School, St Albert’s Catholic Primary School and St Brigid’s Catholic Primary School all created artwork for the site based on health and safety and what makes a safe construction site. The youngsters got kitted out in their own hard hats and high visibility vests as they took part in a health and safety workshop on the site run by the project contractor Forrest. Six pupils from Stockbridge Village Primary School have now formed a health and safety team that will carry out mini site visits, document the development by taking photographs and send out a newsletter to parents about the progress on site. The children will also meet each term with the site manager and the school’s chair of governors to give feedback from their school and be involved in some decision making. Nigel Sedman, director of investment and regeneration at ForViva, said: “We were delighted to welcome pupils from local primary schools along to The Withens to unveil their fantastic artwork - it really brightens up the site. Ted Macdougal, divisional director from Forrest said: “Health and safety is the number one priority in our business so working with Villages to proactively engage with children across Stockbridge has been really useful to raise awareness of potential hazards or risks in the near vicinity of a live construction site, all in a fun way. “The artwork, which is installed on the perimeter hoarding of the site, raises a smile every time our operatives arrive on site”.